With thousands of buyers waiting to get delivery of bike, the TVS Apache 310 is now spotted delivering food. Disclaimer – The manufacturer (TVS Motor Company) has blacklisted Rushlane from it’s events/rides as a consequence of decisions based on restrictive practices. This blog is reliant on available UGC. With thousands of private buyers waiting to get delivery of their new TVS Apache 310, it seems like TVS has started selling their flagship motorcycle commercially – which is now being used for the purpose of food delivery. Youtuber Ssaajan Manoj Jogia has spotted a TVS Apache 310 with a black license plate (rental bike) being used for delivering food in the city of Bangalore. About 35 kms from here, is where the TVS plant is located, which is where the fastest TVS is produced, probably at the slowest rate. 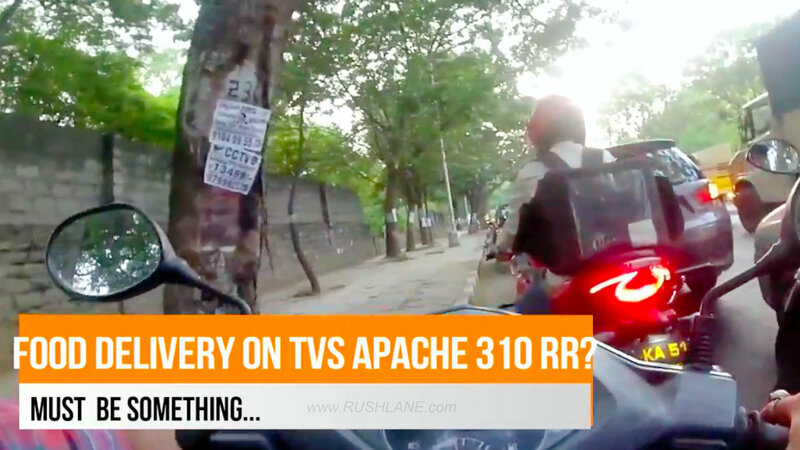 Watch TVS Apache 310 delivering food in the video below. This brings the question, why is the bike being sold to commercial players while private owners are waiting in huge queues? 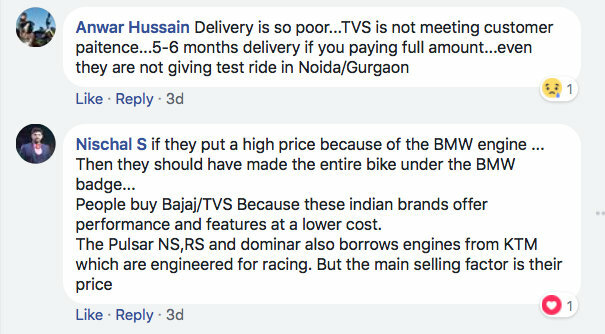 Over the last few weeks, many readers have voiced their opinion regarding the slow rate of delivery of TVS Apache 310. Some readers say that many of the allotted TVS dealers are yet to receive the test ride bikes. In spite of that, some have paid full payment in advance – even then, there is no news of delivery. Some buyers who made payments in advance as early as Nov 2017, are still waiting to test ride the bike. When they question dealers, they say delivery will take about 6 months. “It’s almost 3 months now !!! And still I don’t see this bike on the streets!! anything wrong with it ??? Has anyone booked this bike ? ?